With years of experience, Kim and her team have created a calm family friendly atmosphere and their reputation for excellence continually attracts new clients. Preserving memories is a passion for the team at Frame ‘N’ Art. With meticulous attention to detail, they take the greatest care, pride, and endless patience completing every project. Whether your project is a poster for your child’s bedroom, a family heirloom, a favorite photo, or original artwork; they use only the highest quality framing materials to last a lifetime. The Frame ‘N’ Art teams’ greatest pleasure is ensuring your satisfaction. 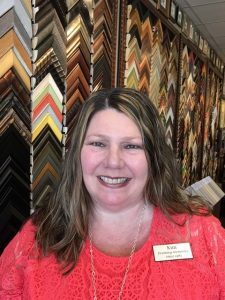 Kim began her framing career in 1983. Kim’s passion for her work shows in everything she does, from an exuberant welcome when you enter the store, to endless patience working to find the perfect project design, all the way through to her pride and excitement in presenting you with the finished product. 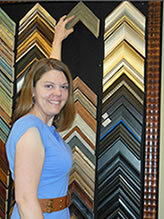 When Meredith first started custom framing in 1996 she quickly realized that this first job was a dream career. 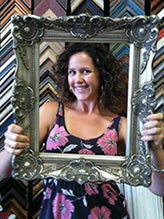 As an avid lover of art and numbers, Meredith found the perfect blend in the many stages of custom picture framing. Having lived in Kansas City, KS and Pittsburgh, PA she has had the opportunity to frame many unique items with an eclectic range of styles. Rearranging the frame wall is one of her favorite activities and she can often be found with her hands full of corner samples. 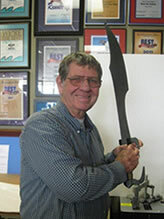 Tommy (lovingly known as “Pa”) joined Frame ‘N’ Art in 1999. He can be seen carrying length of molding to his garage workshop where he chops our moldings. You will find him in the store on Saturdays assisting with larger projects and patiently waiting for lunch time. He likes to buy lunch for the entire staff and everyone sits down and eats like a big ol’ family. Jeanette (“Mrs. J”) has been custom framing since 1974. 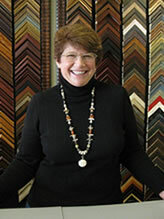 Her beautiful French lines and fillets are just a couple of her many creative custom framing specialties. She has a keen eye for fine details enhancing these delicate, distinctive finishing touches. Aimee has been framing since 2000. She began working at Frame ‘N’ Art while attending ODU, receiving her Masters in elementary education. Her love for educating keeps her busy during the school year as she spends her days in a classroom full of lively, spirited first graders. You can still find Aimee working at Frame ‘N’ Art during summers, holidays, and some weekends. Her love for custom framing can be seen through her outstanding, awarding winning design creations!